The Great Barrier Reef has been given a D on a report card for its overall health by the federal and Queensland governments for the fifth year in a row. The results of the annual report card were based on data collected before this year’s climate change-induced bleaching event that killed about a fifth of the reef’s coral, suggesting next year’s results will be even worse. The report card measures the progress towards water pollution targets, as well as the overall health of the Great Barrier Reef’s ecosystems, including coral and seagrass. The power sectors of China and India combine to be one of the most significant sources of emissions on the planet due to the use of thermal coal plants. Stopping this juggernaut in time is one of the keys to keeping the world to its Paris targets. However, whilst the pipeline of all planned coal plants has fallen in India and China, on current trajectory it threatens to expend the carbon budget years too early. Engineering company Atkins has been selected by the Energy Technologies Institute (ETI) to examine the potential for British salt caverns to store hydrogen to be used in power generation. The six-month carbon capture and storage (CCS) project will identify representative caverns in Cheshire, Teesside and East Yorkshire which could store hydrogen that can be used in gas turbines when demand for electricity is high. The latest report from the Australian Energy Market Operator again allows wind energy to be blamed as one of the prime causes of the state-wide blackout in South Australia, even if it did blow away some of the classic myths about wind energy. But the report raises major questions about the actions of the market operator and the energy market’s rule maker, and the future direction of Australia’s energy transition – because old world thinking is still dominating politics, media and energy management. Coal’s undeniable economic importance should not prevent greater investment in the search for cheaper, low-emissions technology as well as a new price-based scheme in the electricity sector. U.S. and British science agencies Thursday announced a multi-million dollar research mission to study an enormous and exceedingly remote Antarctic glacier, one that they say could hold the potential for major sea level rise before the end of the century. The move suggests that even as world governments move to tackle greenhouse gas emissions, their polar research arms are racing to get a handle on perhaps the most sweeping potential consequence of a changing climate — a large increase in global sea level due to the loss of polar ice — and determine just how rapidly it could arrive. And they appear to have singled out the number one point of vulnerability. For more than one hundred years, we believed avoiding bugs or removing them from our system was the simplest way to improve our health. But while tremendous public health advances have come from controlling dangerous pathogens, we now understand the trillions of other bacteria that live in our body – and in particular, our gut – perform a range of important functions. So when, and how, should we try to manipulate these microorganisms, collectively referred to as our microbiome? Cultivation of coca, the plant from which the drug cocaine is extracted, has long been considered a “deforestation multiplier” in the Andean Amazon rainforests of Bolivia, Colombia, and Peru… But a study published in the journal BioScience last month by a team of researchers with New York’s Stony Brook University found that most deforestation in Bolivia, Columbia, and Peru isn’t caused by coca cultivation. On October 4, a park ranger was killed in the Democratic Republic of Congo’s Kahuzi Biega National Park while trying to protect the park’s rare Grauer’s gorillas. The ranger, Munganga Nzonga Jacques, died at the age of 26. He was killed in the Tshivanga region of the park — an area that was previously believed to be safe for the gorillas, according to a statement by the Wildlife Conservation Society (WCS). AUSTRALIA – This idea might sound ludicrous. The idea of releasing even more cane toads sounds like the height of academic folly. But it works, and my colleagues and I have even managed to convince initially sceptical management authorities and private landowners to adopt the method. Our key discovery was that populations of most species of native predators aren’t affected by the toad invasion. For years, world leaders have been arguing over the best way to protect the chilly Southern Ocean at the bottom of the world from threats like pollution and overfishing. Now, they may finally be one step closer to an agreement. This week, members of the Commission for the Conservation of Antarctic Marine Living Resources (CCAMLR) are convening in Hobart, Australia, for an annual meeting, where they will discuss the conservation and management of the Southern Ocean. And one of their priorities will be to continue negotiations on proposed marine protected areas, or MPAs, that have proved challenging. …One sign that power players are stepping up: Secretary of State John Kerry hosted the third annual Our Oceans event in Washington, D.C., in September, where President Barack Obama and Leonardo DiCaprio also spoke. The Department of State conference yielded significant marine-focused initiatives by scores of world governments and a small number of companies. Scores of spectacular and rare under sea species have been found by expeditions this year to some of the deepest trenches in the Pacific Ocean. They include strange purple orbs, “mud monsters” and a bizarre swimming sea cucumber reminiscent of a flying Mary Poppins. Another voyage found around 500 new undersea methane vents off the US west coast. This doubles the number of known seeps, bubbling up a powerful greenhouse gas. The arapaima (Arapaima gigas) is the largest freshwater scaled fish in the world, topping out at 2.75 meters (9 feet) and weighing up to 200 kilograms (440 pounds)… But its large size and penchant for surfacing to breathe air… has led to its decimation in some areas to feed our hunger for protein. 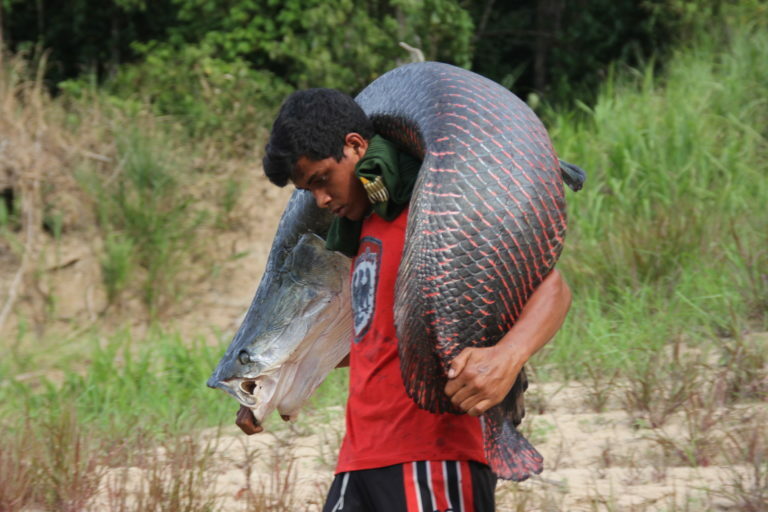 Now, a recent study published in the journal Scientific Reports has found that populations of arapaima, or pirarucu as it’s known locally, are on the mend in the watershed of a 500-kilometer stretch of the Juruá River in Brazil, thanks to communities coming together to protect this fish that’s become a linchpin of their diets and their economies. NEW ZEALAND – It might still be a surprise to some that one of New Zealand’s national delicacies, and part of an iconic kiwi pastime, is made up of threatened species. These threatened species are known as whitebait and are the juveniles of five different native freshwater fish species in the Galaxiidae family, mostly found only in New Zealand. Four of these species have been classified by the Department of Conservation (DOC) in 2013 as at risk or threatened with extinction. America’s largest corporates have now installed more than 1GW of solar capacity across the US, according to a new report that underlines the scale of business investment in alternative energy. The fifth annual edition of the Solar Means Business report, released yesterday by the Solar Energy Industries Association (SEIA), reveals Target as the corporate firm boasting the largest amounts of solar capacity on its books, with 147.5MW of installed capacity. Target is followed by Walmart, with 145MW of installed capacity, and Prologis, with 108MW. USA – If the mention of a cooperative grocery store conjures images of barefoot hippies pawing through bins of nuts and grains like squirrels, then we have news for you. Many of today’s co-ops have modernized their business plans to reach a wider audience. This fact is especially evident in the way many co-op groceries, such as national supermarket chains, are on their way to offering online ordering with delivery in one to two hours. A collective, industry-led approach to procurement in the development of major infrastructure projects across the UK would help achieve a circular economy in the construction sector, a new report from a cross-sector group has found. The white paper published today (20 October) by the Major Infrastructure – Resource Optimisation Group (MI-ROG) states that embedded circular principles in infrastructure projects would generate positive environmental impacts and help build greater resilience in supply chains. NEW ZEALAND – One council is on a mission to make a dump more than just a pile of rubbish. The New Plymouth District Council is looking to develop the Colson Rd transfer station into a Resource Recovery Facility (RRF), which could include retail shops, a cafe, education experiences and a repair workshop. The $1 million development is still in the design phase but would hopefully be open by the end of 2017 and help get people to shift their thinking about waste, council’s waste and compliance lead Kimberley Hope said. Public support for onshore windfarms is far higher than widely believed, according to a new opinion poll, even in rural areas. Wind turbines are also far more popular than fracking or nuclear power, contrasting with the UK government’s decision to block onshore windfarms but back shale gas exploration and new nuclear power plants. Japan is likely to face international criticism at a whaling summit this week for killing whales in the Southern Ocean in defiance of a court ruling. Japanese fleets killed more than 300 minke whales, many of them pregnant, when they resumed so-called scientific whaling in 2015-16 after a hiatus the year before because the international court of justice decided the hunts were not scientific and should cease. All Tesla electric cars will now be equipped with the hardware needed for them to be fully autonomous, paving the way for the carmaker to be the first to roll out self-driving vehicles at a large scale. Announcing the move yesterday, Tesla chief executive Elon Musk said Tesla EVs would be able to independently pilot themselves from New York to Los Angeles by the end of next year.